A composite material that is suitable for electrodes in lithium batteries have been successfully created by a team of researchers. This composite can help increase the life cycle of batteries and the charging speed. As we all know, most of the consumer electronics nowadays are based on lithium batteries which are the conventional used on mobile phones, tablets and electric cars. 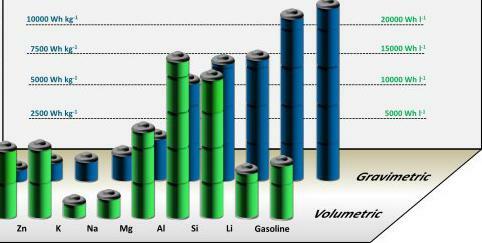 They have much more energy density and power capacity compared to other battery systems. Even with the progress made in electronic systems, mobile device batteries only last day and it takes few hours to charge an electric car. To improve such facts, scientists are working to increase the power density and charging rates of lithium batteries which directly impact the anode material. Scientists tested the anodes based on tin dioxide which can achieve higher capabilities like absorb more lithium-ions and store more energy than the usual carbon anodes often used. But the tin dioxide has very weak cycle stability as the capacity decreases very fast but can only be recharged few times only. To solve the issue, scientists turned to hybrid materials which are also called nanocomposites. They developed a material comprising tin oxide nanoparticles on a base layer of grapheme. The tin oxide particles are extremely small and can directly be grown on the graphed. This particularity helps to improve its tolerance to volume changes which enables the lithium cells to be more stable and have longer life cycles. Scientists tested the results and figured the energy was increased 3 times than the conventional batteries in one hour. These results were obtained thanks to the enrichment of the material which in itself is very conductive. The anode is very quick and reactive, which allows it to store much more energy in just a short time of charge. The faster charging cycles always led to a quick reduction in capacity. The antimony-doped anodes developed by the scientists, however, retain 77 % of their original capacity even after 1,000 cycles. The nanocomposite anodes can be produced in an easy and cost-effective way. And the applied concepts can also be used for the design of other anode materials for lithium-ion batteries. Scientists hope that the development will pave way for lithium-ion batteries with a significantly increased energy density and short charging time.